In the first place, the enormous cutting tackles, among other ponderous things comprising a cluster of blocks generally painted green, and which no single man can possibly lift- this vast bunch of grapes was swayed up to the main-top and firmly lashed to the lower mast-head, the strongest point anywhere above a ship's deck. The end of the hawser-like rope winding through these intricacies, was then conducted to the windlass, and the huge lower block of the tackles was swung over the whale; to this block the great blubber hook, weighing some one hundred pounds, was attached. And now suspended in stages over the side, Starbuck and Stubb, the mates, armed with their long spades, began cutting a hole in the body for the insertion of the hook just above the nearest of the two side-fins. This done, a broad, semicircular line is cut round the hole, the hook is inserted, and the main body of the crew striking up a wild chorus, now commence heaving in one dense crowd at the windlass. When instantly, the entire ship careens over on her side; every bolt in her starts like the nailheads of an old house in frosty weather; she trembles, quivers, and nods her frighted mast-heads to the sky. More and more she leans over to the whale, while every gasping heave of the windlass is answered by a helping heave from the billows; till at last, a swift, startling snap is heard; with a great swash the ship rolls upwards and backwards from the whale, and the triumphant tackle rises into sight dragging after it the disengaged semicircular end of the first strip of blubber. Now as the blubber envelopes the whale precisely as the rind does an orange, so is it stripped off from the body precisely as an orange is sometimes stripped by spiralizing it. For the strain constantly kept up by the windlass continually keeps the whale rolling over and over in the water, and as the blubber in one strip uniformly peels off along the line called the "scarf," simultaneously cut by the spades of Starbuck and Stubb, the mates; and just as fast as it is thus peeled off, and indeed by that very act itself, it is all the time being hoisted higher and higher aloft till its upper end grazes the main-top; the men at the windlass then cease heaving, for a moment or two the prodigious blood-dripping mass sways to and fro as if let down from the sky, and every one present must take good heed to dodge it when it swings, else it may box his ears and pitch him headlong overboard. One of the attending harpooneers now advances with a long, keen weapon called a boarding-sword, and watching his chance he dexterously slices out a considerable hole in the lower part of the swaying mass. Into this hole, the end of the second alternating great tackle is then hooked so as to retain a hold upon the blubber, in order to prepare for what follows. Whereupon, this accomplished swordsman, warning all hands to stand off, once more makes a scientific dash at the mass, and with a few sidelong, desperate, lunging, slicings, severs it completely in twain; so that while the short lower part is still fast, the long upper strip, called a blanket-piece, swings clear, and is all ready for lowering. The heavers forward now resume their song, and while the one tackle is peeling and hoisting a second strip from the whale, the other is slowly slackened away, and down goes the first strip through the main hatchway right beneath, into an unfurnished parlor called the blubber-room. Into this twilight apartment sundry nimble hands keep coiling away the long blanket-piece as if it were a great live mass of plaited serpents. 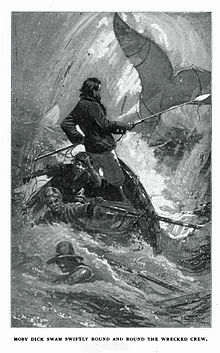 And thus the work proceeds; the two tackles hoisting and lowering simultaneously; both whale and windlass heaving, the heavers singing, the blubber-room gentlemen coiling, the mates scarfing, the ship straining, and all hands swearing occasionally, by way of assuaging the general friction.